To see a rainbow you need raindrops and sunlight. You just can’t help being an a$$ no matter the subject. Bless your heart. You're so freakin' stupid. Rainbows can be caused by many forms of airborne water. These include not only rain, but also mist, spray, and airborne dew. (Taken from your link) BTW they are NOT always in the shape of an arc. Who's going to stand out in the rain with an expensive camera and take pictures? You have to take the pics from off the porch or from the cab of your truck. I voted for M-5's, only one that looked like it was raining. Caustic Burno wrote: Just hard to compete with pink fuzzy birds. Only pink birds here are plastic flamingos in peoples yards. Oh come on, she was having a shower! 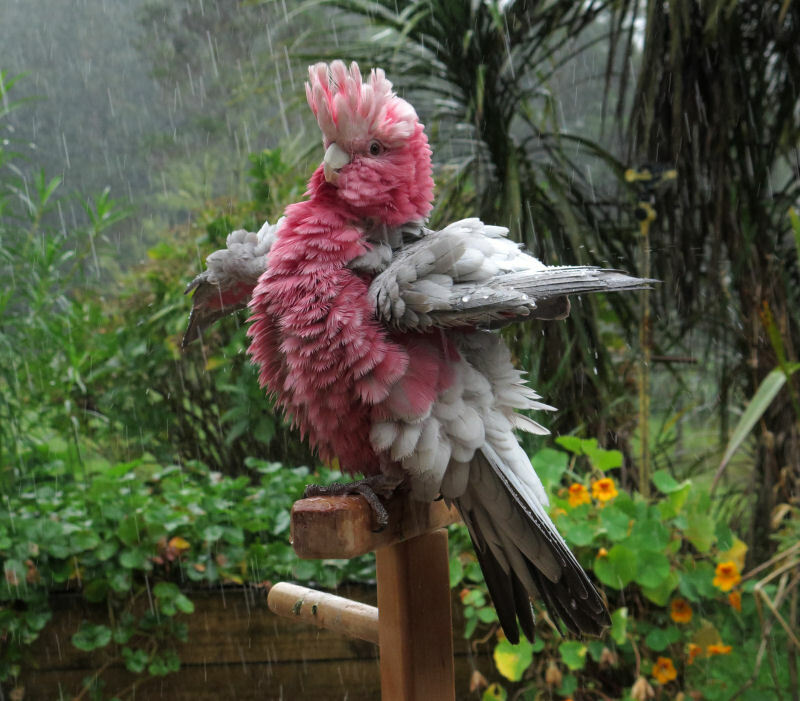 She's an Australian Rose Breasted Cockatoo or Galah. There are lots here as pets. I inherited her. Showers are hard to see in pictures. Great photos everyone, this was fun. I really liked that pic! They look like little shyte disturbers! Our local equivalent would be the Stellers Jay... Noisy, obnoxious, brightly colored, bold, thieves.. There's only one of those pink and grey terrors in this neighbourhood. The Eastern Rosella on that link, are resident here and fly around in noisy small flocks. Most of the native parrots have been wiped out by introduced mammals. Nesikep wrote: Our local equivalent would be the Stellers Jay... Noisy, obnoxious, brightly colored, bold, thieves.. I've come to despise pinterest for their invasive popup wanting you to register. You can dismiss it, but a minute later, it comes right back.